The Bells’ terrific carnival-carrying Argosy. Three of five generations in Bell’s Amusements: Elwin Bell Sr, Roy Bell, Elwin Jr and Selina Bell. Show ’n shiny drive wheels. 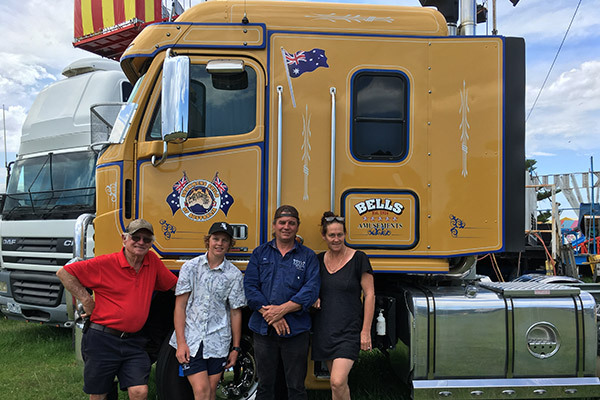 The family of Bells’ show trucks. The older Argosy, 2002 Cat-powered model. 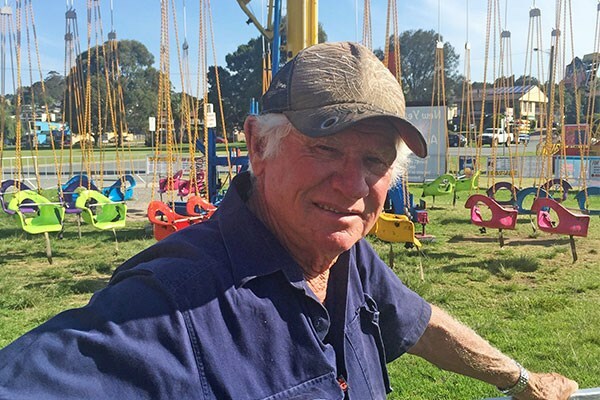 Seventy-four-year-old showman Elwin Bell is the owner and operator of Bell’s Amusements, providing carnival rides to shows all over the country. 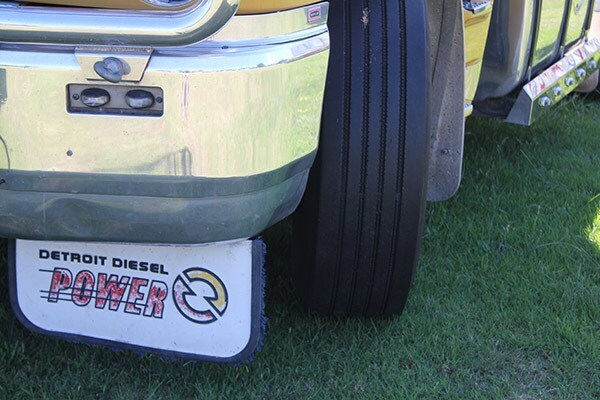 He has been travelling the highways and byways of mainland Australia for as long as he can remember, so he’s had to become pretty good at improvising with trucks and trailers. 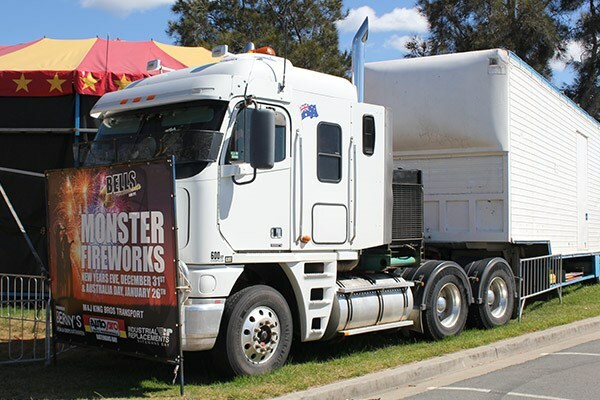 For example, once while Elwin and his showman father Roy were travelling up southern New South Wales’ infamous Clyde Mountain in the early 1960s, the big end went in the old truck they were driving. Elwin drove one of the other convoy vehicles to Goulburn to get new bearings, which they then had to fit into the old engine five times before it finally got up the mountain. Roy Bell started his famous travelling boxing tent in 1924, touring the country in a three-quarter-ton T-model Ford. Back then the Hume Highway was dirt, the only bitumen was between Melbourne and Geelong, and his wife could get out and walk quicker than their Ford at points along Victoria’s Great Ocean Road and in the Snowy Mountains of NSW. Really steep bits required going up in the stronger reverse gear, while the downhill brakes included a log dragging on the back. In 1938 the couple splashed out on a brand-new International prime mover, incorporating a very early version of the sleeper cab for Elwin’s older brother and sister. The Inter pulled a custom-made all-metal trailer, which was a big deal in those days. Elwin loves old trucks, and still has his first truck, a fully restored 1948 tray-body Chevy, sitting in his shed at home in Queanbeyan, ACT — not that he and wife Sandra are home much. Also retired at Queanbeyan are three old W-model Kenworths, the oldest a 1962 ‘Seattle’ model with a two-stroke 8V-71 Detroit in it. 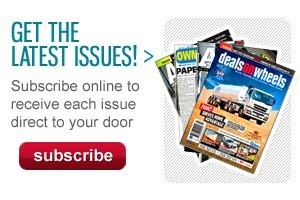 "Just put a bit of rego on any of them and you can jump in and go to Darwin," Elwin says. Also recently retired is an old fibreglass Atkinson. Was Elwin worried about rolling over in a plastic cab? "If you drive sensibly you shouldn’t be in a rollover," he replies. "You don’t want to roll over in any of them." Elwin reckons the Atkinson, with its 350hp 8V-71 GM engine, was the biggest truck on the Australian show circuit 35 years ago. "I lost the title for a while, but I’ve got it back," he says proudly, referring to his 2002 Freightliner Argosy, powered by a 600hp Cat. The old 18-speed Argosy is comfortable and "goes very nice", he adds. Meanwhile, Elwin’s son Elwin Jr is equally happy with his 2010 Argosy, with its 550hp Detroit DD15 engine and Eaton automated manual transmission. 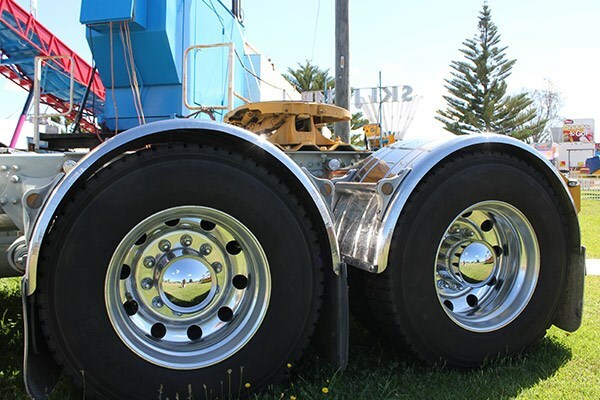 He bought it two years ago for $85,000 from a Blue Circle Southern Cement contractor with 700,000km on the speedo, and has only put 40,000km on it since. 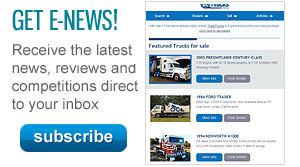 "It’s been terrific, the best truck I’ve ever bought," Elwin Jr says. He says he’s had no problems with it, and has only added a new Horton fan and clutch as precautionary measures. 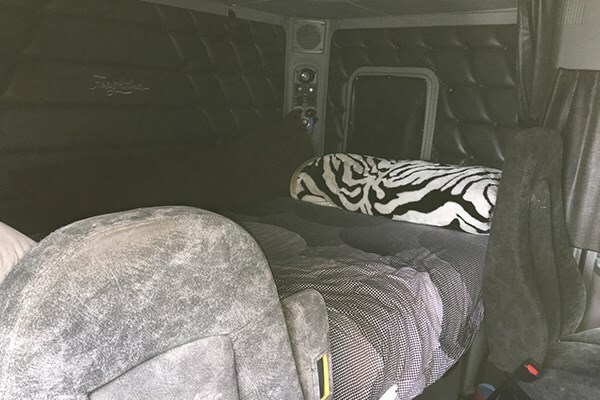 "It’s beautiful inside, with a great big bed," he adds. The bunk is cooled by a Kubota diesel motor, which if left on standby will automatically fire up to keep the batteries charged. 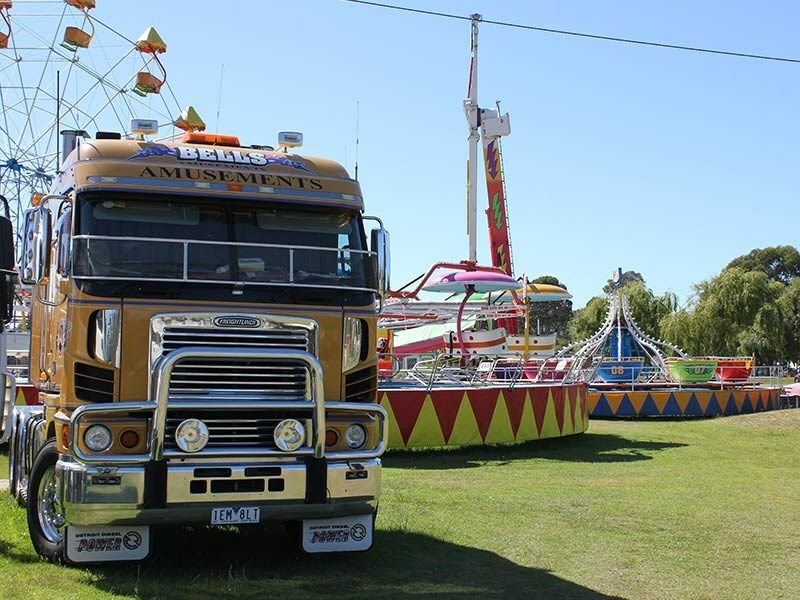 That’s important, because the Freightliner could be parked up for a week at a time at a show, and when Trade Trucks spotted it, the Argosy was spending nearly a month at the NSW holiday hotspot of Batemans Bay while the nightly carnival went on around it. Not that Elwin Jr sleeps in the truck much, because he and wife Selina have a 50-foot trailer-home they live in. Selina tows the trailer behind a single-drive DAF, which is short enough for the combination to stay under 19 metres. Elwin Jr says the DAF’s 430hp Paccar engine will "pull anything". The Freightliners and DAF are part of a mixed fleet that includes the Volvo, Mercedes-Benz, Kenworth, Isuzu and UD brands, in both prime mover and rigid form. The Bells do routine servicing themselves, and they and their other drivers have to be jacks of all trades with the rides as well. Fascinatingly, the Bell’s Amusements rides — ‘thrills without the spills’ — pack down to become their own trailers. No Limit, the Thunderbolt, the Cha Cha and so on all fold down on top of the axles to move on to the next town or city. They are inspected by engineers every 12 months. 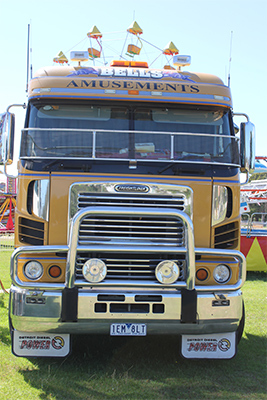 Registration for the trailers and trucks is a very sore point with the Bells. 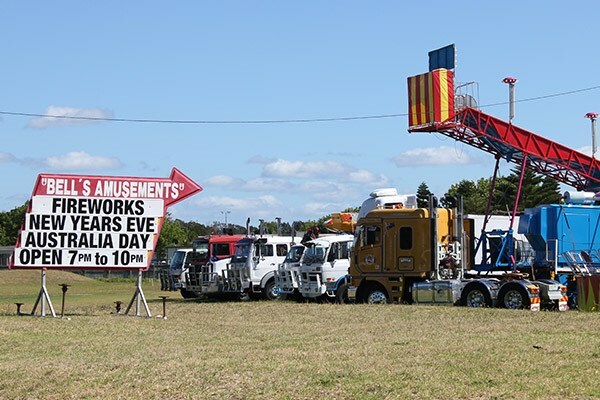 The company is charged the same as if they were running their equipment 24 hours a day, rather than for 15,000-20,000km a year, which the Bells believe justifies a plant-hire rego rate.